This colorful pillow is simply adorable and would look perfect as a decoration in your house! 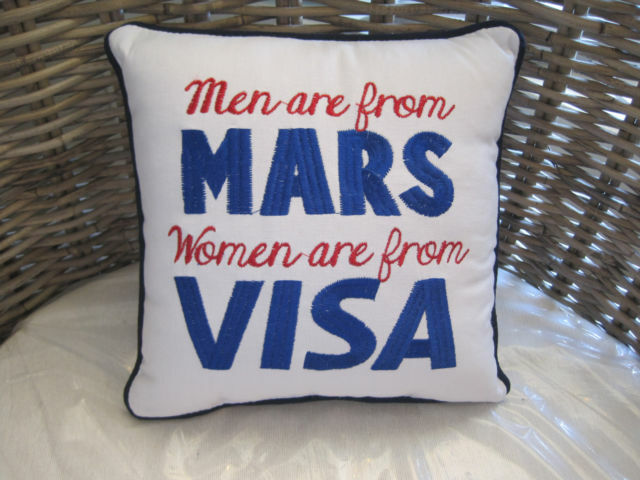 It is a small, square white pillow that has “Men are from MARS Women are from VISA” in blue and red script and bolded letters. It measures 9 x 9 square. It has also has a dark blue piping around the edges. This whimsical pillow is a wonderful gift or great to add a little bit of humor to your home!